Note from Editor: Hans-Werner Lienau is a published author, figure collector, Large Scale model railroader, and diorama builder in Hamburg, Germany. I when Hans-Verner when I helped him track down a set of Large Scale Lionel figures for his collection. When Hans-Werner's hobby of collecting toy figures from Elastolin and similar brands collided with his purchase of an LGB train, he decided to start using some of his pieces to in settings with his Large Scale trains. When I saw the desert photo in the title, I asked him for more information, and he sent the photos on this page and a brief explanation. I've tried to "fill in the gaps" where I thought it was necessary. This particular project is best suited to go with Large Scale trains (like LGB and AristoCraft), but the principle of refinishing toys to use for models applies to any scale. 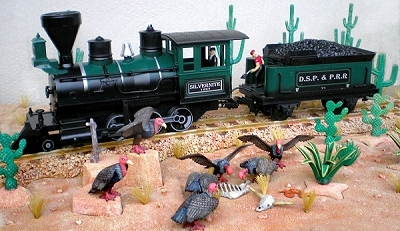 Before describing my project, I'd like to fill in the background about me and my combination of model railroading and Wild West figures. 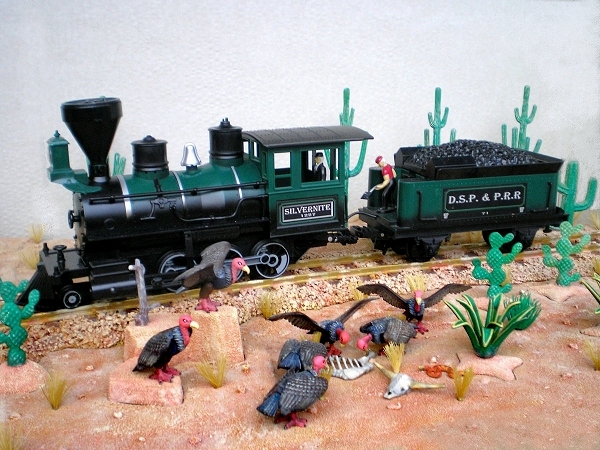 Plastic Figures and Toy Trains - From my earliest school days, I had an HO model railroad and some books by German Wild West author Karl May. His characters, including the Indian“Winnetou” and his friend “Old Shatterhand” were the heroes of my childhood. Every day going home after school I had to pass by a small shop that sold the Heinerle-Wundertüten (a surprise bag, literally "Bag of Wonder”). 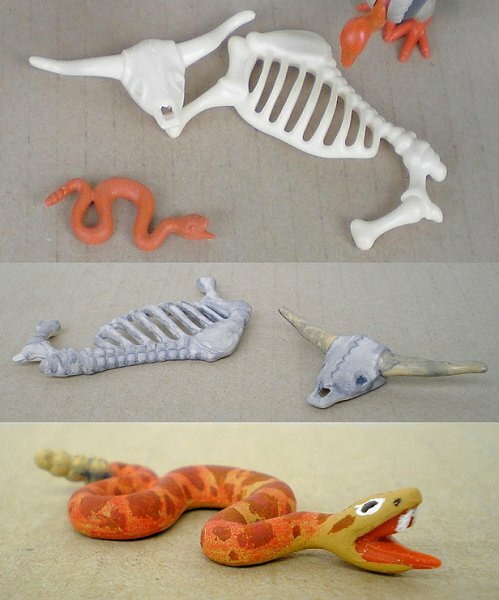 Although you never knew exactly what you were going to get, it always included candy and one 60 mm figure. 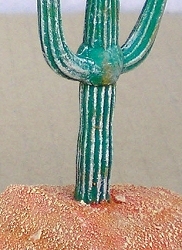 The themes of the figures varied from Wild West to Farmland or Africa. 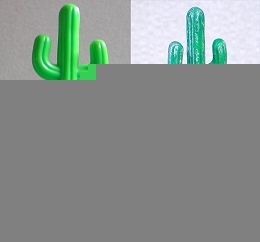 They were manufactured by Domplast, Manurba or Jean. I have been collecting plastic figures ever since (though these days I mostly collect Elastolin figures made by the German company Hausser). 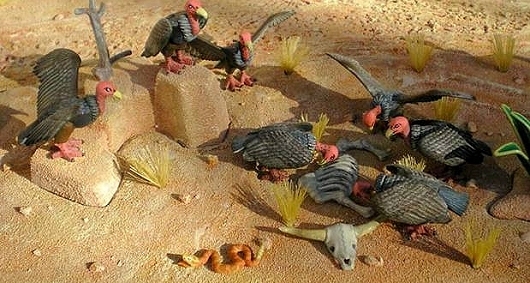 In those years, my favorite summer activity was playing with my figures outside. My favorite winter activity was model railroading in the basement. 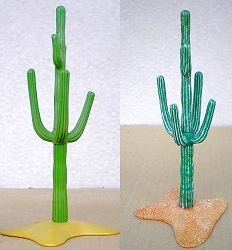 As I grew a little older and started spending time with other activites, my figures gradually disappeared. 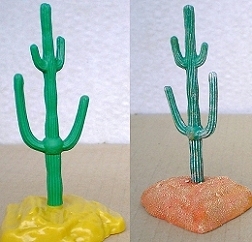 However, the Wild West figures remained in a forgotten bag deep in my mother's cellar. LGB Reinvigorates Interest in Both Hobbies - Years later, when my little daughter and I saw an LGB layout, both hobbies reawoke at the same time. We hoped to build an outdoor railroad using LGB trains, Pola buildings and figures by Elastolin and Preiser. But there is always a difference between theory and reality - we have only been able to build temporary layouts, and most of them were built indoors. Planning Dioramas - All along, I have also planned to build dioramas to display pieces from my figure collection - most of them shouldn't stay out on a garden railroad for long anyway. But in my present circumstances, the only time the trains run is at Christmas, so I have been focusing on building dioramas. 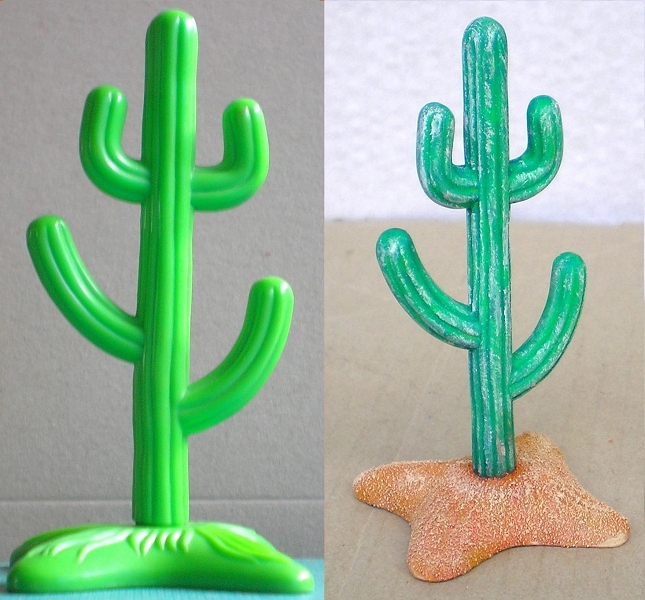 In the meantime, my collection of Wild West figures has grown to about 1000, and I sometimes repaint inexpensive figures or build my own from "scratch." An off-brand prickly pear gets the same treatment. 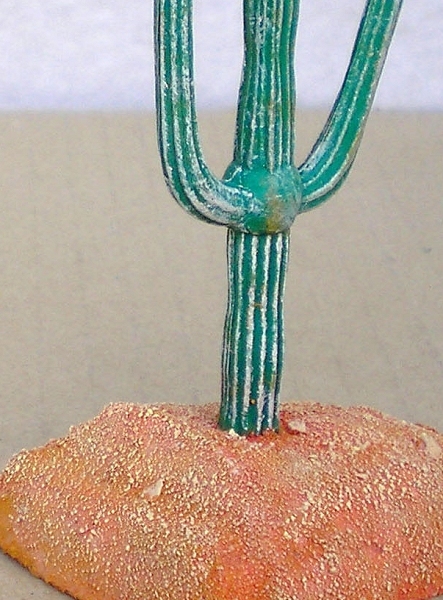 I liked the new appearance so much that I started also painting my Playmobil cactus (from set No. 7068). 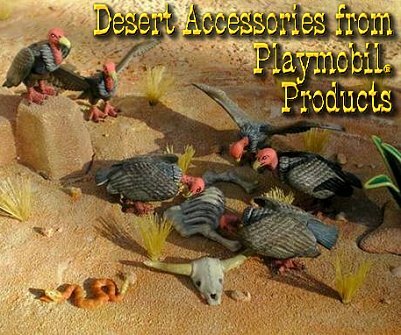 I also started planning a desert diorama to use for photographing my figures. Finally, Playmobil's saguaro gets a makeover. This was going so well that I starting borrowing pieces from other Playmobil sets. 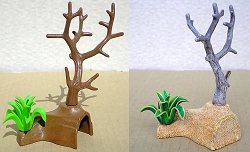 The base of this dead tree from set 3748 gets the same treatment as the other bases. The tree is painted gray, then dabbed with another color with a brush that is all but dry. 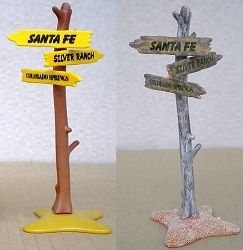 This dead tree set is from set 4205. the base gets "plugged" before the paint goes on. This sign is from set 3748. Using a "dry brush" or similar approach allows you to "weather" the signs without wiping out the lettering. Of course, no U.S. desert is complete without wildlife, living or dead. 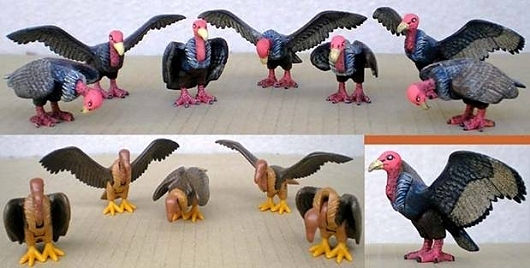 So I got out my Playmobil vultures and painted them carefully. Attention to detail counts, such as painting their talons a contrasting color. A set of "bleached" cow bones and a couple of plastic sidewinders have also undergone a detailing and dry brush treatment. 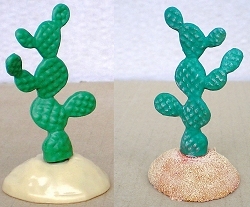 Here the upgraded animals and other accessories are posed together on a sand base that uses the same color as the cactus stands. In the photo to the right, I have placed one of my Large Scale locomotives to give a sense of the size of these things. Remember, this whole project started with a trip to the flea market. Keep an eye out for toys or other things you can use to add interest to your model railroad, display village, diorama, or other display. To Return to the HalloweenTrains.com(tm) Primer Page, click here. Note: Family Garden Trains™, Garden Train Store™, and Big Christmas Trains™ are trademarks of Breakthrough Communications (www.btcomm.com). All information, data, text, and illustrations on this web site are Copyright (c) 1999, 2000, 2001, 2002, 2003, 2004, 2005, 2006, 2007, 2008, 2009, 2010, 2011, 2012, 2013 by Paul D. Race. Reuse or republication without prior written permission is specifically forbidden.